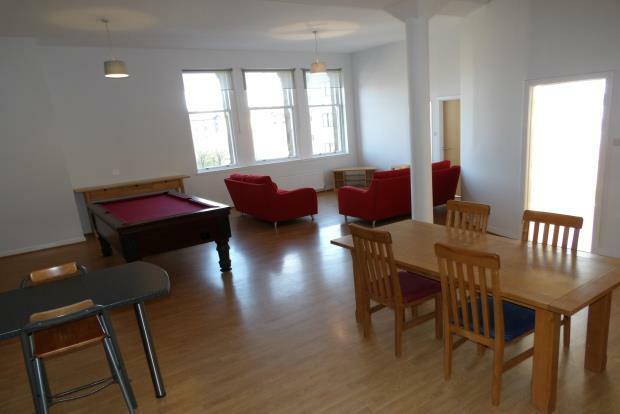 2 Bedroom Flat To Rent in Glasgow for £1,050 per Calendar Month. With epic proportions and a magnificent grandeur, 53 Morrison Street is a rarely available, stunning warehouse conversion dating back to 1933, recently upgraded including a full new roof and refurbished facade. Living up to the high expectations, this impressive two bedroom apartment is beautifully presented and offers generous accommodation. The secure entry leads to a wonderful communal entrance with lift and stair access. Located on the second floor, the property comprises of an entrance hall opening up to a huge open plan living space which boasts near double height ceilings, large windows, kitchen area, lounge and dining furniture plus a pool table. The well equipped kitchen includes breakfast bar with two stools, electric oven, gas hob, dishwasher, fridge and freezer. The large master bedroom features a kingsize bed, drawer units and built in wardrobes and has a sylish ensuite shower room. The second large bedroom also features a kingsize bed, drawer units and built in wardrobes along with a separate study. The family bathroom is a white three piece suite with shower over the bath. Two separate storage cupboards are accessed off the entrance hall, one of which houses the washing machine. The property benefits from a gas central heating system and there is access to a secure resident's car park. Located in Tradeston with many earmarked developments including a new base for Barclays Bank. Handy for the city centre across the Tradeston (Squiggly) Bridge to the Business district and Finnieston as well as Strathclyde and Caledonian Universities plus the City of Glasgow College. Good road links to the M8, M77 and M74 motorways, walking distance to local subway stations and the nearby Springfield Quay offers a range of restaurants, bars, cinema and casino.